As NPR’s Sasha Ingber has reported, Egyptian discoveries such as the one announced Saturday are both an archaeological achievement and a public relations coup – new finds can attract visitors to the country, still recovering from a slowdown in tourism caused by political unrest. 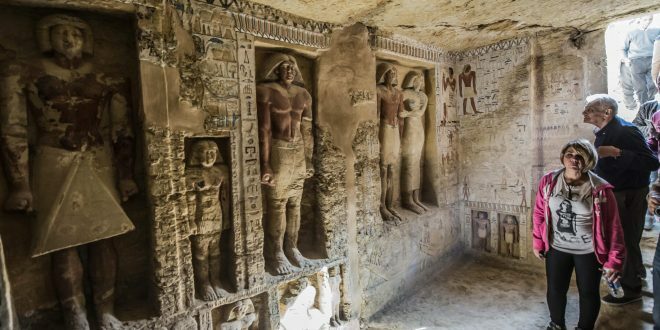 Another Fifth Dynasty tomb, one that belonged to Hetpet, a priestess to the goddess of fertility Hathor, was revealed in February. And last month, Egypt’s Ministry of Antiquities announced the discovery of 100 wooden feline statues and dozens of mummified cats. This latest tomb was uncovered on Thursday, Reuters reports, and still contains a number of sealed shafts that could lead to sarcophagi or other archaeological treasures. Excavation of those openings will begin Sunday.